NOTE: This article was selected as a finalist in the 2015 DC Student Arts Journalism Challenge, an annual competition designed to identify and support talented young arts writers. Some movies go to great lengths to show you how profound they are. Others just assume you’ll pay attention. Inside Out is the latter. The latest Pixar movie follows an 11 year-old girl named Riley, who moves with her family from her childhood home in Minnesota to a dingy apartment in San Francisco. The move makes Riley sad. She misses her best friend, her hockey team and her childhood innocence. But her parents, despite good intentions, are too busy settling in to notice that Riley is struggling. This is a story you’ve seen many times before, more likely in your life than at the movies. That’s because the story doesn’t appear to have much in the way of exterior stakes. And it doesn’t. But Inside Out finds a way to make the interior stakes exterior by zooming in right between Riley’s temples, where emotions Joy (Amy Poehler), Sadness (Phyllis Smith), Fear (Bill Hader), Disgust (Mindy Kaling) and Anger (Lewis Black) take turns influencing Riley’s actions from a sleek control center in her cerebal cortex. Influencing is the key word. 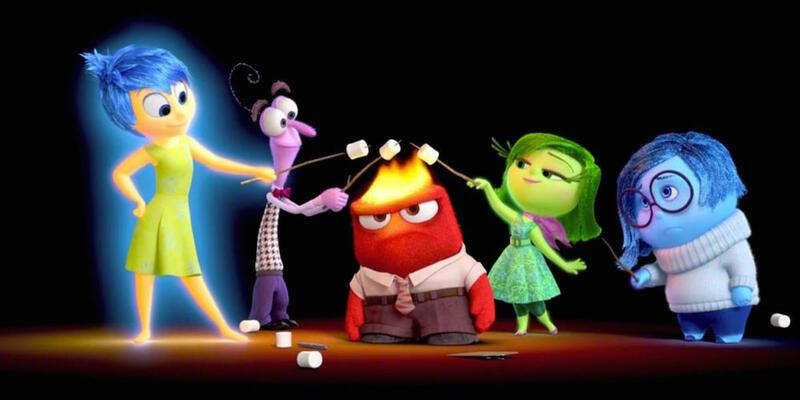 Inside Out wisely avoids drawing a direct link between emotions and actions. It’s correlation, not causation. Dramatizing such abstract relationships would seem near impossible, but director Pete Docter and the team at Pixar have pulled it off with stunning complexity. A train of thought stops shuttling when Riley drifts off to sleep. Islands of Personality distinguish Riley from others her age, and they break off as she moves away from early childhood. Memories take the shape of spheres, which coalesce in an elaborate shelving system maintained by a team of roving memory managers who toss out the old ones (“Old phone numbers? She has them in her phone!”) and replace them with new ones. When emotions touch memories, they turn the color of that emotion, forever tinged by the association of a particular feeling. But the movie’s true achievement is its contention that Sadness and Joy are not at odds, and that one ought not exist without a little of the other. As voiced with the righteous positivity of Leslie Knope by Poehler, Joy’s outlook on life is unburdened by setbacks, complications, failure – real life. Happiness has limits. Sadness, meanwhile, starts the movie as Joy’s underling, forced to sit quietly in a corner while Joy keeps Riley humming along. But when Joy and Sadness have to take a journey from the outskirts of Riley’s mind back to the control center, Joy slowly realizes that Sadness has her place. This dawning realization comes with a little help from Bing Bong (Richard Kind), a dazzling and surreal mixture of elephant, cat, human and dolphin that represents Riley’s imaginary friend, for whom she has little use in her state of burgeoning adolescence. With tinges of melancholy in Kind’s vocal performance, Bing Bong is at once as irrepressibly happy as Joy and as deeply encumbered as Sadness. The movie doesn’t announce it thus, but Bing Bong unites the two emotions, or at least brings them to a place of greater mutual understanding. There are plenty of serious ideas, and even some darkness, below the shiny surface of Inside Out, but there’s also a bounty of great jokes, visual and verbal. Anger gets his news from a daily copy of “The Mind Reader,” printed in the style of a traditional broadsheet newspaper. Fear sees the danger in even the most mundane task. A foray into abstract thought flattens Joy and Sadness into bundles of two-dimensional shapes, then squiggles, then lines. During the end credits, peeks into the minds of other characters and pets reveal the more basic comedic potential that would have made Inside Out more conventionally enjoyable but less ambitious. Oh, right, I should mention the movie’s ceaselessly riotous running gag. Or better yet, you should see it for yourself, if you’re not already experiencing it in your head at this moment. Inside Out is content to be unusual without telling you as much. No one in the movie bats at an eye at the fact that Riley’s interested in hockey, even though pop culture usually tells us that young girls play with dolls and princesses while their brothers play sports. As Linda Holmes of NPR points out, no one in the movie is overtly villainous or ill-intentioned. In fact, the absence of a malevolent presence makes the sacrifices and transformations in Riley’s head all the more significant, and at times tragic. Here’s a rare movie about children that respects them as people with thoughts and feelings but doesn’t expect them to embody the character traits of an adult. Riley’s emotions are important, but they’re different from her parents’ emotions: more scattered and tentative, less cohesive and sure-footed. They’re vibrant and energetic and passionate and curious, just like Riley, just like all children. They’re also subject to change. Inside Out, more than almost any movie I can remember, recognizes childhood as a period of immense internal turmoil and acknowledges that innocence and naivete have their place in a person’s development. The spirit of this movie is generous and kindhearted but far less naive than Joy. It knows, even when Riley doesn’t, that growing up is supposed to be hard, and that becoming a teenager means leaving a part of yourself behind. Happy endings are nice fantasies, but it’s possible to learn something from a more ambiguous conclusion as well. Inside Out fits neatly into the Pixar tradition of breathing life into objects or creatures that humans sometimes take for granted. Toy Story offers a reminder that possessions carry the weight of our emotional associations. WALL-E posits that a robot can experience emotions just as vividly as we can. Even Cars, considered a throwaway in the studio’s sterling canon, presents automobiles in a nostalgic, reverent light. With Inside Out, Pixar has forayed for the first time into the realm of the intangible. But the studio’s track record makes its triumph seem not like a miracle, but a logical next step. By now, it’s a well-established meme that this movie has induced tears in many viewers. I count myself among them. But I didn’t tear up because the movie untangles all of my uncertainties about my emotions or anyone else’s. I teared up because the movie dares to ask and provoke questions that would make most movies, or studio executives, run away screaming. It doesn’t have all the answers, and some of its implications about emotional development will have you debating with your friends through teary eyes as you emerge from the theater. But director Pete Docter and his co-writers Josh Cooley and Meg LeFauve have designed a movie that works whether it reflects your worldview or not. Through the eyes of a young girl, we see a sliver of ourselves. Mark Lieberman graduated from American University in May with a bachelor’s degree in journalism and a minor in cinema studies. 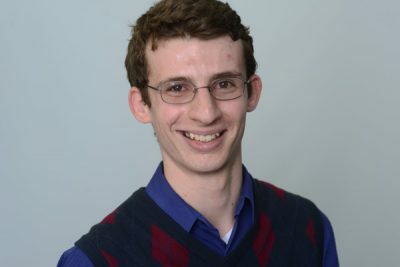 He’s a reporter for the Current Newspapers, covering local politics, education, community affairs, business, trends and features for one of D.C.’s premier print publications. He is passionate about all forms of pop culture from movies and television to music and books, and he believes that thinking about and discussing entertainment is a worthwhile and critically important pastime. His work has been published at USA Today, the Washington Post, American University’s student newspaper The Eagle and his personal blog.